How do planting plans evolve from initial client preferences to final installation? Usually through a sequence of steps. First, we talk with the client about the style of plantings they prefer and how this relates to the overall design style for the project. Next, we create a plant booklet that outlines recommendations (includes a photo and characteristics) based on our initial conversations and the realities of the site where the plants are to be installed. The booklet might contain anywhere from 25-100 different plant varieties. Clients may be more or less horticulturally inclined, but usually we ask them to select plants that they either love or hate, and then we work to fill out the rest of the palette. After we have a general idea for plant selection and style we usually create a massing plan. This sets the relationships and geometries of the plantings (usually based on size, and the location of any specimen plants). We then assign plant varieties, moving, modifying, and tweaking things as we go. At this stage, we may lead the clients on a tour to the local nursery to view the plants ‘in the round,’ as this is usually much more informative than viewing pictures alone. For big trees, we may go to a tree nursery and select specimens with the client. After we assign varieties, we usually present the plan to the client for final approval. Any final changes are made, and the plan is ready for construction. This usually is not the end of the process however. 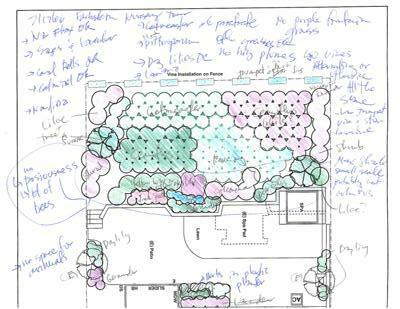 In the field we do a preliminary layout of the plants prior to installation, to make sure the client likes the overall layout and positioning of the plants. We have found this process to be very effective as it is much harder to move plants after they have been planted. Once the client has approved the field layout we start planting. Remember, green side up!